1. You grew up in Amherst, NY. What was it like growing up and playing hockey in the Buffalo area and where did you play? It was great growing up in the Buffalo area playing youth hockey because there was a lot of talent not only within my age group, but at every age group within the program. I started out playing youth hockey with the Buffalo Regals, a program I continued to play with until my Bantam Minor year. During my Bantam Minor year I played for the Rochester Alliance along with a few other players from the Buffalo area. Following that season I came back home and played for the Amherst Knights program for my Bantam Major season as well as my U16 and U18 seasons. 2. In addition to playing with the Amherst Knights you also spent your Freshman, Sophomore and Junior years playing High School hockey at Williamsville North. What was the experience of playing with High School hockey like for you? It was awesome playing for my high school. Every Thursday night we would play in front of our student section and it was really fun. It was also very nice to win a New York State Championship during my last year at Williamsville North. We had an amazing team that season and finished the year with a record of 24-0-2. I moved to Michigan for my Senior year to play for the Oakland Jr. Grizzlies 18U of the Tier 1 Elite League. While living in Michigan I went to a public school and lived with a billet family whose son played on my team. 3. I’m assuming that the decision to move to away from home at such a young age to play hockey was not an easy decision for you or your family. How did you and your family handle the move for your senior season? Actually, it was a very easy decision. My older brother Phil moved away from home at the age of 16 to play hockey and he has been away from home ever since. For my family, my decision to leave home was easier, because it was something that my family had already been through. At that stage in my life I felt that moving away from home was just something that I had to do if I wanted to further my hockey career, and they understood. 4. After your time in Michigan with the Jr. Grizzlies U18 team, you left home again to play the 2012-2013 season with the Connecticut Oilers of the EJHL, a Junior A league based out of New England. What made you choose to go to Connecticut instead of other options you may have had? After playing a year for the Oakland Jr. Grizzlies I had some opportunities in the EJHL and other opportunities in the NAHL. I ultimately chose the Connecticut Oilers because of the EJHL’s history of its players earning opportunities to play at the college level. I also felt that the EJHL was more suited to my style of play and would help me grow the most as a player. 5. What was the competition like in the EJHL? It seems like that league is steadily gaining recognition from NCAA scouts as a premier scouting location. How was the competition compared to the OJHL? 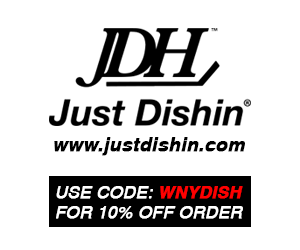 The EJHL was a fast paced skilled league that was very up and down and really had no systems. The OJHL was also a skilled ofensive league but there was more systems and physicality in the league. 6. 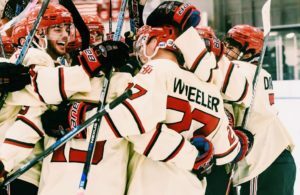 For many people that will read this article, the thought of moving away from home to pursue a hockey career might be intimidating, whether they admit it or not. What advice/thoughts can you give to hockey players looking to move away from home to further their career that might help ease the transition? It is intimidating and diferent than any sport out there. But in hockey you have to sacrifice your social life, and family life to be able to have a successful hockey career. My family believed in me and i believed that it was the right decision to move away and play at a higher level and grow up. Not only did it help my hockey career but it helped me to grow up as a person and do things i never had to do before, such as grocery shop, do laundry and cook all of my meals. The advice i would give is to be open and positive about every situation that might happen. It is a big step in the maturation process and gives you a great chance to focus on hockey rather than pressures surrounding you at home. The friends that you will make in the hockey world will be your friends for life. 7. 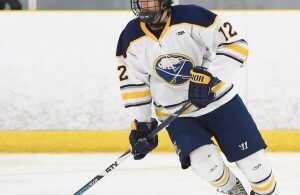 After one season you decided to leave Connecticut and return home to play for the Bufalo Jr Sabres of the OJHL, a league that is also very highly scouted by NCAA Division I coaches. What prompted you to return home? Was it a desire for better competition? Did you want to be closer to home and family or was it something else? I had a very up and down season in Connecticut. I was in and out of the line up in the middle of the season and by the end of the year i was playing forward. It just was not the right situation for me. I came home and had a couple options to go to if i wanted to leave Connecticut the following year such as the CCHL, NAHL, and the Jr. Sabres. I went to the Jr. Sabres main camp and had a meeting with Coach Peca and he persuaded me to stay and play at home. I trusted him to help guide me in the direction that i needed to go. I was not planning on coming back home as i enjoyed living away especially because i lived in an apartment in CT with my good friend Jake Rosen from Bufalo and we had a great time. But it came down to that fact that if istayed home i would have more opportunities to advance my hockey career. 8. Prior to last season with the Junior Sabres you were given an A as a team captain even though it was your first season with the club. What did/does the leadership role mean to you?What changes did you make either on or of the ice to embrace the role as a team leader? The leadership role to me is a huge thing. Its an honor being a leader, it meant that i had to be a good role model for the younger guys on the team. I don’t really think i changed much, I just tried to lead by example on and of the ice and always stayed positive through any adversity. 9. During your season with the Jr. Sabres you scored 13 goals to go along with 38 assists for 51 points in 52 games, earning you OJHL First Team All-Star recognition. Clearly ofense is a big part of your game but what type of player do you see yourself as? I like to see myself as an ofensive defenseman. I like to start the breakout and then jump into the rush, I try to create as much ofense as i can without being a defensive liability. I am working on being a well-rounded defenseman that can play a complete game. But, i feel the best asset to my game is the ofensive side of the puck. 10. This past November you announced your commitment to play NCAA Divison I Hockey beginning this fall for Union College, a program on the rise after just winning the 2013-2014 National Championship. Can you describe what the recruiting process was like and what ultimately led you to choose the Union as the best place to continue your career/growth as a hockey player over some of the other schools that were recruiting you? The recruiting process was a very hard but yet rewarding time for me. It was tough to narrow it down to one school but i feel that i made the best decision for my hockey career and in the school aspect as well. Even though i was contacted by a few other schools and had ofcial and unofcial visits, my visit to Union really sold me. I just really liked the campus, the rink, and felt very comfortable and trusting in the coaches. I believed that i fit the mold of a hockey player and person that they recruit and felt that it was the best fit for me.